It may be news to some drivers (and cyclists), but traffic laws apply to person riding bicycles too. Because cyclists share the road with vehicles much larger than them, and because accidents involving cyclists can cause serious and even fatal injuries, it is important for cyclists to obey laws, and always ride carefully. Drivers should always watch for cyclists, recognize that they have the same rights on the road, and always maintain a safe distance. The following are the Washington Rules of the Road for operating a bicycle on the road. It is a traffic infraction for any person to do any act forbidden or fail to perform any act required in RCW 46.61.750 through 46.61.780. These regulations applicable to bicycles apply whenever a bicycle is operated upon any highway or upon any bicycle path, subject to those exceptions stated herein. Every person riding a bicycle upon a roadway shall be granted all of the rights and shall be subject to all of the duties applicable to the driver of a vehicle by this chapter, except as to special regulations in RCW 46.61.750 through 46.61.780 and except as to those provisions of this chapter which by their nature can have no application. Every person riding a bicycle upon a sidewalk or crosswalk must be granted all of the rights and is subject to all of the duties applicable to a pedestrian by this chapter. Stop or decrease speed. Left hand and arm extended downward beyond the side of the bicycle. RCW 46.61.760: Riding on bicycles. Every person operating a bicycle upon a roadway at a rate of speed less than the normal flow of traffic at the particular time and place shall ride as near to the right side of the right through lane as is safe except as may be appropriate while preparing to make or while making turning movements, or while overtaking and passing another bicycle or vehicle proceeding in the same direction. A person operating a bicycle upon a roadway or highway other than a limited-access highway, which roadway or highway carries traffic in one direction only and has two or more marked traffic lanes, may ride as near to the left side of the left through lane as is safe. A person operating a bicycle upon a roadway may use the shoulder of the roadway or any specially designated bicycle lane if such exists. Persons riding bicycles upon a roadway shall not ride more than two abreast except on paths or parts of roadways set aside for the exclusive use of bicycles. No person operating a bicycle shall carry any package, bundle or article which prevents the driver from keeping at least one hand upon the handlebars. Every bicycle when in use during the hours of darkness as defined in RCW 46.37.020 shall be equipped with a lamp on the front which shall emit a white light visible from a distance of at least five hundred feet to the front and with a red reflector on the rear of a type approved by the state patrol which shall be visible from all distances up to six hundred feet to the rear when directly in front of lawful lower beams of head lamps on a motor vehicle. A lamp emitting a red light visible from a distance of five hundred feet to the rear may be used in addition to the red reflector. A light-emitting diode flashing taillight visible from a distance of five hundred feet to the rear may also be used in addition to the red reflector. Release the intoxicated bicycle rider to a competent person. The law enforcement officer shall not provide the assistance offered if the bicycle rider refuses to accept it. No suit or action may be commenced or prosecuted against the law enforcement officer, law enforcement agency, the state of Washington, or any political subdivision of the state for any act resulting from the refusal of the bicycle rider to accept this assistance. The law enforcement officer may impound the bicycle operated by an intoxicated bicycle rider if the officer determines that impoundment is necessary to reduce a threat to public safety, and there are no reasonable alternatives to impoundment. The bicyclist will be given a written notice of when and where the impounded bicycle may be reclaimed. The bicycle may be reclaimed by the bicycle rider when the bicycle rider no longer appears to be intoxicated, or by an individual who can establish ownership of the bicycle. The bicycle must be returned without payment of a fee. If the bicycle is not reclaimed within thirty days, it will be subject to sale or disposal consistent with agency procedures. If you’ve been injured in a bicycle accident you need an experienced attorney on your side to get the compensation you deserve. Contact the law office of Parke Gordon Law Firm in Spokane today for a free consultation. Call (509) 482-7274 for a free case review. 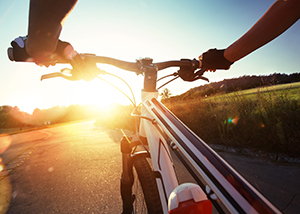 This is your opportunity to discuss your bike accident case with an experienced and trusted attorney.